It is almost impossible that you didn’t hear about the 40th anniversary of Audemars Piguet’s Royal Oak this year. Designed by the legendary Gerald Genta in 1972 as a luxury sports watch in stainless steel at the price of ten times a Rolex Submariner at that time. Last January, Audemars Piguet introduced a slightly modified successor of their icon watch, the Royal Oak ‘Jumbo’ (ref.15202ST). The dial of this new version is closer to the original Jumbo (ref.5402ST) as Genta designed it in the 1970s. Of course, Audemars Piguet refrained from using their in-house caliber 3120 movement (it is too thick for the Jumbo case) and keeps it real with the caliber 2121 movement, based on Jaeger-LeCoultre’s caliber 920. We did a small comparison of the new Jumbo and the current Jumbo earlier this year (click here to read it). 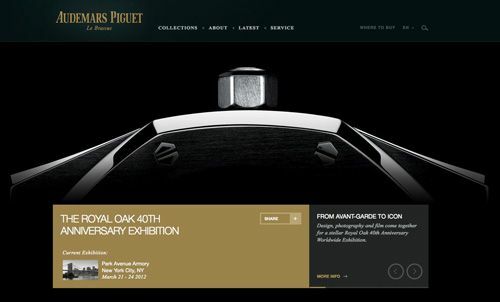 To celebrate the 40th anniversary of the Royal Oak, Audemars Piguet Le Brassus organized this exhibition and it was hosted by Audemars Piguet North America. They have organized a four day exhibition for the public. On display is also the very own Royal Oak Jumbo owned and worn by Gerald Genta himself. Our friends at Hodinkee posted a picture of this Royal Oak 5402ST with strange gold bezel on their blog today (click here). A great way to start this year’s Spring! 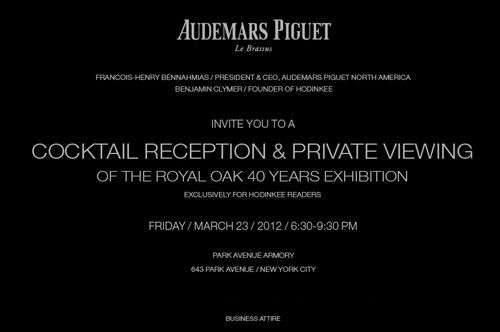 If you are – like us – an avid reader of Hodinkee, you are also invited to visit their cocktail reception and private viewing of the Royal Oak collection at the Armory. The only thing you need to do is visit this link and contact Hodinkee to sign-up for this event. Last but not least, during this exhibition, Audemars Piguet also introduces their book ‘Royal Oak’, written by their museum director for the last 20 years. For $100 USD, you will receive a book with over 300 pages on one of our favorite stainless steel sports watches ever. For now, this book will only be available at the AP boutiques in Bal Harbour and New York City. In the future, you can also find – or order – it at selected book stores.